On April 24, 2015, I piled into a minivan with some writers, some editors, a few coolers of food, and heavens knows how many pens, notepads, books, and computers. We drove into the Pocono Mountains of Pennsylvania that beautiful spring morning. This trip was part of my “rewards” for backing the Uncanny Magazine Year One Kickstarter. It was my first writing retreat. It was my first opportunity to talk to published writers, get my work critiqued, learn about the industry, and connect with new faces. It was uncanny how much writing is like my day job, and how much it isn’t. It was uncanny how comfortable I felt around total strangers, and how nerve wracking a critique is even though I receive them every day. (I’m a web designer. We critique a lot.) It was uncanny how much the cabin felt like trips to the mountains I’d visited as a child, and how very different everything felt now that I’m not. And yes, there was writing. I don’t know if all writing retreats are the same, this being my first one, but every few hours someone announced, “Okay, I’m going to write for about an hour,” and everything stopped because everyone else wanted to do the same thing. I could not be happier with the reward that I received. It was fantastic to dive into my fiction and come up gasping for air every few hundred words. In between writing jags, we celebrated with food, drink, games, and an uncanny horror story. Uncanny Cabin wasn’t the special reward in the kickstarter. 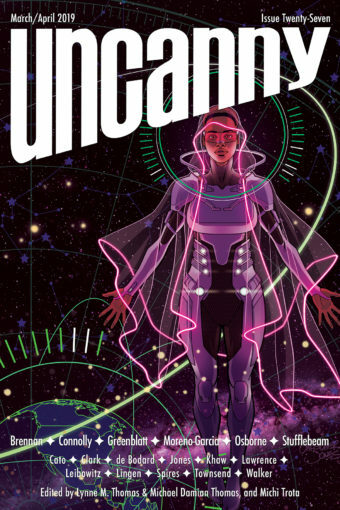 It didn’t hold a candle to the ongoing delight thousands of people get from Uncanny Magazine and its accompanying Podcast. Lynne and Michael Thomas, Michi Trota, Erika Ensign, Steven Schapanksy, Deb Stanish, Amal El-Mohtar, and C. S. E. Cooney, have produced a classy, amazing, solid compilation of Science Fiction and Fantasy on a regular schedule, with big names and small, since November 4, 2014. It’s accompanied by a delicious podcast (I’m sorry that’s really the only word my brain will let me use for it — delicious. It’s up for a Parsec Award for heaven’s sake.) and captivating cover art. This is a serious accomplishment, the kind that many of us have dreamed of since we discovered reading and writing and Cricket magazine. There aren’t enough superlatives to describe these folks and the magic they’ve produced. It’s uncanny. To be honest, volunteering for group events with strangers isn’t usually something I would do, and I spent a good amount of time hemming and hawing last year over the choice, before deciding to take a chance. On August 11th, a few days ago, Uncanny Magazine announced the Year Two Kickstarter. The line up is fantastic, the goals are reasonable, and most importantly, Uncanny Magazine is worth the investment. I’ve already pledge to travel to the Uncanny Cabin for Year Two, but that shouldn’t stop you from kickstarting the magazine. Rewards range from public acknowledgement in the first issue to NAMING. A. UNICORN. Seriously, how often do you get a chance to name a magazine’s unicorn? If you can’t back the Kickstarter, buy a subscription or become a Patron. As the recipients of this reward, this magical every-two-months box of brain candy, the least we can do for ourselves is support the things that make us giddy with joy, or sorrow, or enchantment. Uncanny Magazine is one of those things. As for me, I’m sharpening my pens for another round of uncanny adventures.